Definition at line 28 of file dispatchtypechained.h. Constructs a DispatchTypeChained object with the given parent. Definition at line 28 of file dispatchtypechained.cpp. Definition at line 320 of file dispatchtypechained.cpp. If false the dispatcher will be unregistered for performance reasons. This method can be used to prepare actions for dispatcher as in a Chain of Actions there is no garantee of registering order. In the common case if the dispatcher has registered any action, or in some special case that it doesn't need actions it will return true. Definition at line 346 of file dispatchtypechained.cpp. Definition at line 165 of file dispatchtypechained.cpp. References Cutelyst::Component::reverse(), Cutelyst::Request::setArguments(), Cutelyst::Request::setCaptures(), Cutelyst::Request::setMatch(), and Cutelyst::DispatchType::setupMatchedAction(). 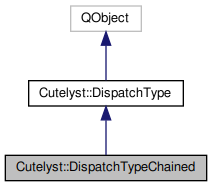 Definition at line 196 of file dispatchtypechained.cpp. References Cutelyst::Action::attributes(), Cutelyst::Component::name(), Cutelyst::Component::reverse(), and Cutelyst::Action::setAttributes(). Definition at line 266 of file dispatchtypechained.cpp.